Indiana Governor Mike Pence told George Stephanopoulos that SB101, the "religious freedom" bill he signed into law, is not about anti-gay discrimination. Yet when he signed it, as the graphic above so helpfully points out, he was surrounding by several men, Micah Clark, Curt Smith, and Eric Milled, who have been working for years to demonize gays and lesbians. When asked by the Indianapolis Star who the lobbyists in this photo are, Pence refused to identify them. 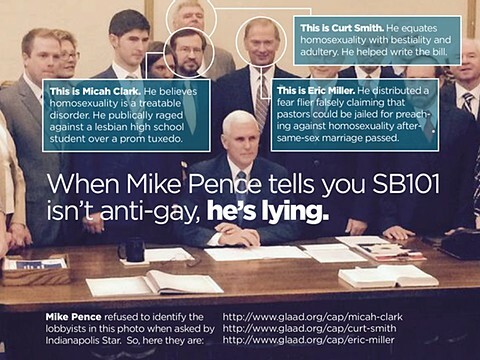 Mike Pence is a liar out to destroy the state of Indiana with his anti-gay animus.